​This week Focused on the Magic is all about favorite sidekicks. I am a HUGE Darkwing Duck fan. I've loved him since he came out. I also really like his sidekick, Launchpad McQuack. Launchpad was actually around before DW was, he worked for Scrooge McDuck in Ducktales (Also another favorite show!) and later became the Terror That Flaps in the Night's sidekick. He's a great guy! Want to see some other great sidekicks? Click the button below to visit, and also add your own! 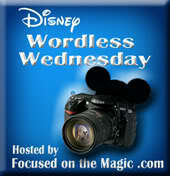 I love this week's topic at Focused on the Magic. Castles! Think you need to be right in front of the castle to get the perfect shot? Nope! Play the angles! Shoot from the side, the back, or up above! The Peoplemover would have given a superb shot of Cinderella's castle for me on our last trip, but Mr. Disney Magic's head was in the way! *sniffle* Next time!! And I'll know better where to sit! I love this shot, taken on the bridge. No one was in the way, I could stop and not be jostled, and it's different, than the usual taken in the front shot. For more castle shots, click the button below! This week's Focused on the Magic shot is a September calendar Shot. I've never been to Disney in September because of school aged kids and hurricanes, but I do think this shot is a good autumn shot... it makes me think of fall, and honestly.. I just love Pooh. Click on the button below to see other great Disney sites!